The French veteran beats Ricardas Berankis in straight sets. 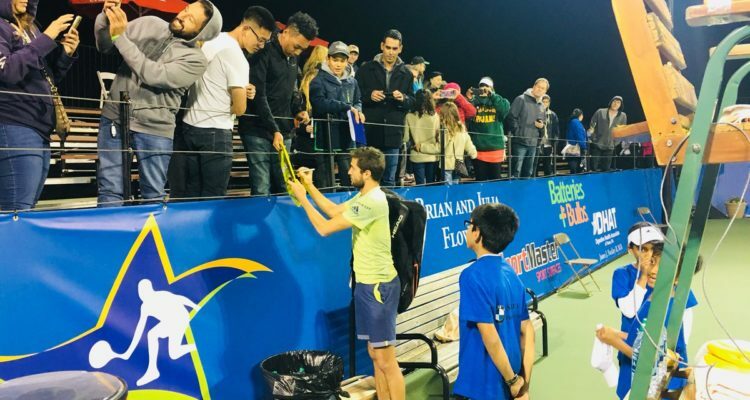 Gilles Simon headlined Tuesday’s first round action of the $150,000 Irving Tennis Classic held at the Four Seasons Golf and Sports Club at Las Colinas. The No. 5 seed from France defeated Ricardas Berankis of Lithuania 6-2, 6-2. Simon capitalized on six of his 10 break point chances to advance in one hour and nine minutes. Next up for the former World No. 6 will be Mirza Basic from Bosnia and Herzegovina, who eased past lucky loser Herbert Jody Maginley of Antigua 6-2, 6-1. Russian veteran Mikhael Youzhny came back from a set down to overcome Matthew Ebden of Australia 3-6, 6-1, 7-6. The 35-year-old Moscow native won 54 per cent of the total points played to secure victory in one hour and 39 minutes. Youzhny awaits the winner of the encounter between sixth seeded German Maximilian Marterer and Australian wild card entry Alex de Minaur. Sweden’s #NextGenATP star Elias Ymer fought past Daniel Elahi Galan of Colombia 6-2, 3-6, 6-3. The 21-year-old, who is competing in first tournament since reaching the quarterfinals of the ATP Challenger in Budapest last month, sent down four aces, winning 69 per cent of his first service points to prevail after one hour and 54 minutes. Ymer will next take on either No. 4 seed Marton Fucsovics of Hungary or German wild card Philipp Petzschner. This entry was posted in ATP Challenger Irving, ATP Challenger Tour and tagged ATP Challenger Tour, Gilles Simon, Irving Tennis Classic.